Candles are pretty neat. They're great to provide some mood lighting, nice scent, and they can go a long time. I've been using a couple of candles as a crutch this week while we watch our friends' very farty dog to help keep the living room from smelling too bad all the time. The wick doesn't burn down very quickly if there is a steady supply of melted wax for the fabric to soak up and burn off. To extend the life of a candle, break up the "shell" of an old candle that didn't get burnt and toss it down in the well of another candle. If placed properly and used in the right amounts, the additional wax will melt and burn, keeping the candle alive longer. This seems to work better with candles whose wax naturally burns quickly (generally leading to a really tall flame). 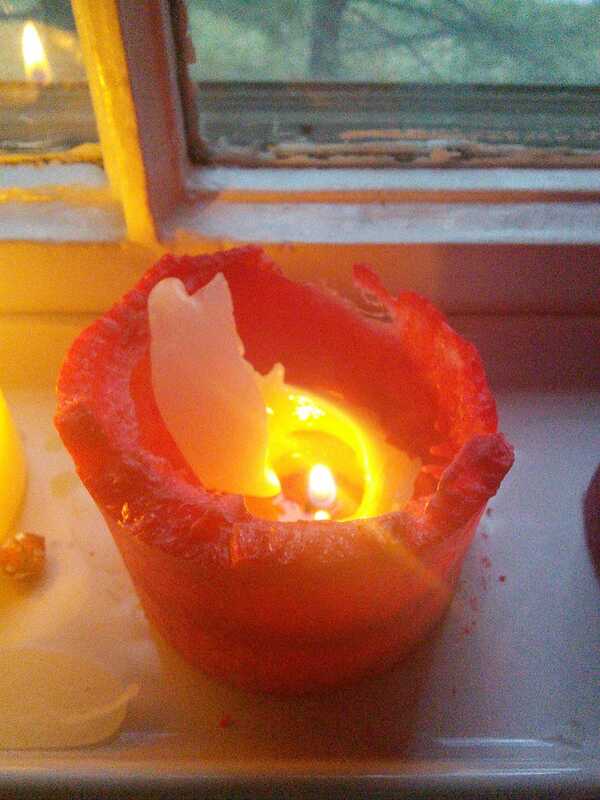 If the candle is keeping a large pool of melted wax naturally, adding wax will only cause the wick to get snuffed out. Depending on the candles in question, it might not be possible at all, so your milage may vary.